Most of the online/offline “Speech to Text” conversion Apps are either priced or if at all free, they are poor in conversion. As you might already know google.com also allows you to input your search query via speech. i.e you just need to click that small Mic icon and you are ready to go. But this speech recognition is limited for online use. The newer versions of Google Chrome Web-Browser include an awesome speech recognition engine that even works offline (without internet connection) but with limitations – the feature is only available to Google search box (text input field) and you can’t use it to dictate long Articles (say a message for email). Now here comes Dictation, an Impressive speech recognition app powered by Chrome itself and is not limited to text boxes. Dictation converts your spoken voice into digital text. You can use it to write long emails, narrate essays or even write blog posts. The good part is it can detect any accent very smoothly. ofcourse it will, its Google’s speech recognition engine btw. 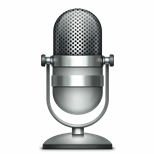 Click the big microphone icon to activate dictation mode and talk. If you make a mistake, or if Chrome makes an error in transcription, simply click the incorrect word and edit it inline. You can say “new line” to insert a new line or “delete everything” to make a fresh start.